This bold and bonkers experiment to try to get computers to write a hit musical has a big question at its heart: can human creativity be coded? There’s genuine jeopardy, as the computer boffins hand over the material to a professional cast of actors and musicians. Will the world’s first computer-generated show be a hit or a flop when it opens on the West End stage? Episode 1. A team of scientists and musical theatre writers team up in a world first experiment – to try to work out a recipe for success in musical theatre, and then to task computers to use that knowledge and generate a hit! The musical’s Idea, Story, Setting, Lyrics and Music –all must be substantially crafted by computer, leaving musical theatre duo Benjamin Till and Nathan Taylor to collaborate with their computational masters and curate the computers’ output. The ultimate goal – to stage the world’s first computer-generated musical professionally in London’s West End. Computer and human creativity are put to the test like never before. This is a story – like the best musicals – with high drama, low comedy, tears and conflict, and an utterly original premise. Episode 2. 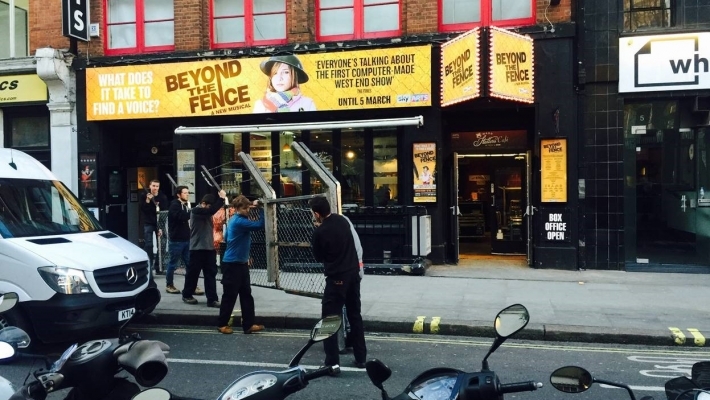 The experiment to stage the first ever computer-generated hit musical in London’s West End steps up a gear, as a cast and creative team come on board to rehearse the new musical - ‘Beyond the Fence’. Will the music and lyrics generated by computer be fit for the West End Stage? Will an audience of musical theatre diehards at a secret workshop for the show, who have no idea of the show’s computer origins, spot anything unusual about the piece? How will artists cope with taking dictation from computers, working within constraints, approaching creativity in an entirely new way? And – the ultimate test - what will the audience at the opening night gala performance of the world’s first computer generated musical make of it? Can computers generate art? And if they can what does that mean for us?